the first successful summit of Mount Kilimanjaro was completed by German geographer, Hans Meyer, after six weeks of climbing. However, it is possible that Kilimanjaro's summit was reached by locals prior to Hans Meyer, but was never recorded. tourists (approximately) attempt full ascent of Kilimanjaro every year. Kilimanjaro reaps in $50 million a year for the Tanzanian economy, accounting for 45% of total income generated by the country's 15 national parks altogether. constantly evolve. They melt and shrink in dry season but regenerate in the wet. However, since 1912, Kilimanjaro has lost 82% of its ice cap, and 55% of its remaining glacier fields since 1962. Scientists predict all ice on the mountain may disappear within the next 20 years. supports five ecosystems: savanna bush land, sub-montane agro-forest, montane forest belt, sub-alpine moorland and alpine bogs, and the alpine desert and the arctic zone.Climbing it is simply is virtual world climatic tour. 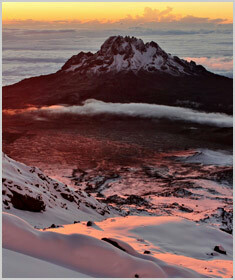 make up Kilimanjaro: Kibo is the summit; Mawenzi at 16,893 feet (5,149 meters); and Shira at 13,000 feet (3,962 meters). Uhuru Peak is the highest summit on Kibo's crater rim. Uhuru, Swahili for "Freedom," was named in 1961 when Tanganyika gained its independence . Tanganyika later joined with the islands of Zanzibar to form Tanzania. Dubbed as "Everyones Everest"Kilimanjaro, the highest mountain in Africa and fourth highest of the Seven Summits, and is considered the tallest freestanding mountain in the world, rising 15,100 feet (4,600 meters) from base to summit. With its permanently snow-capped summit, it has long been a source of fascination for travelers. The first recorded sighting of the mountain dates back some seven hundred years. Chinese fisherman wrote of a white peak on the African coastline. By the 17th Century, Europeans were using the mountain as a navigational aid. Even so, reports by the East India Company in the 1880s of a glacial summit existing in an equatorial zone were treated with some skepticism in Britain. Only when an expedition was launched in 1889 were the original reports confirmed, as the first Europeans ascended the mountain. One hundred years later, in 1989, a celebration was held to mark the centenary of this event. Incredibly, the guest of honor was the original local guide. He was 118 years old. After Tanzania achieved its independence in 1961, Kilimanjaro was transformed into a National Park. Covering some 7500 square km, it is now listed as a World Heritage Site. Thousands of tourists flock to the park each year determined to conquer the most famous mountain on the African continent. For many of them, it will be the hardest thing they ever do. everlasting tanzania travel Kilimanjaro is not a climbing mountain. That is what makes it so appealing to the amateur. It's probably the only mountain that high which grant equal opportunities for trekkers of all ages and fitness levels to reach its summit. You don't need any alpine climbing experience, no crampons, ice axes, ropes or any sort of technical equipment required on alpine climbs unless you're doing the almost technical Western Breach. There are very few places on e each route which requires you to use your hands as well as your feet. Mostly, it is just an uphill trek and any reasonably fit person stands an even chance of reaching the summit. everlasting tanzania travelWhile two of Kilimanjaro's volcanic formations are extinct — meaning that they are highly unlikely to erupt again — Kibo (the highest peak) is merely dormant, so there is the possibility that it could erupt. Estimates have the last major eruption dated to 360,000 years ago, but volcanic activity was recorded just 200 years ago. While Kibo is dormant, gas is emitted into the crater, causing several collapses and landslides, with the most extensive ones creating the area known as the Western Breach. 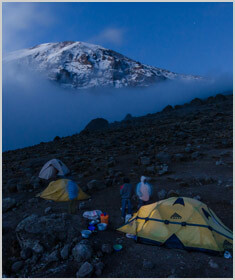 While the name Kilimanjaro has its origins in the KiChagga word for "white," it is becoming increasingly less so. While it still covered with ice caps and glaciers at higher levels, global warming is quickly changing the climate and scientists expect the famed snows of Kilimanjaro to disappear sometime between 2022 and 2033. The fastest ascent and descent of Mount Kilimanjaro was by Spanish mountain runner, Kilian Jornet in September 2010. At the time, the Spaniard was 22 years old. He reached the summit in a record time of 5 hours, 23 minutes and 50 seconds – beating the previous ascent record from Kazakh mountain runner, Andrew Puchinin, by one minute! However, it doesn't end there. After reaching the summit, Kilian then ran down the mountain to base camp reaching it in a total time (up and down) of 7 hours and 14 minutes. This incredible feat smashed the previous ascent and descent record set by Simon Mtuy of 8 hours and 27 minutes! The youngest person to reach the summit of Kilimanjaro is Keats Boyd, at the tender age of 7 years old. The Los Angeles resident reached the summit on the 21st January 2008. Richard Byerley was 'officially' the oldest person to reach the summit of Kilimanjaro. Byerley reached the summit in October 2010 at the ripe old age of 84 years and 71 days. However, his record was incredibly surpassed by Martin Kafer (85) and his wife Esther (84) in October 2012. The Canadian-Swiss couple now hold the record as the oldest man and oldest women to climb Kilimanjaro. Esther's achievement surpassed the previous oldest woman to reach the summit, Bernice Bunn, who climbed to the Roof of Africa at age 83.